Elongated green foliage with white half shaped blooms characterizes the Peace Lily. Keep it within 5 to 8 feet of a window for best results. Do not place your plant in direct sun. Direct sunlight can damage the Peace Lily's foliage. If the leaves begin to yellow, it may mean it is receiving too much sunlight. Move it to a less lighted area. The main care requirement for your Peace Lily is water. This plant requires heavy watering, but you must allow the soil to dry out in-between watering to a point as well. This plant will let you know when it needs water. The leaves will begin to droop. Allowing the foliage to droop slightly in-between watering has turned out to be successful for me. However, do not let it droop severely. Once the plant is watered the foliage will spring back up. This plant also loves higher humidity levels, so providing it with a nice misting a couple times a week will help the plant remain beautifully healthy. The rubber plant is a popular houseplant characterized by its thick, shiny, oval shaped foliage in either a deep green or burgundy color. 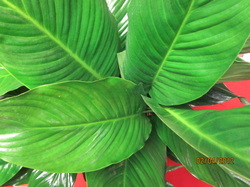 The rubber plant requires medium to low light so keep within 5 to 8 feet of a window for best results. It should be watered once or twice a week, keeping the soil moist at all times. If lower leaves begin to yellow or die your rubber plant may be pot bound. The rubber plant is known for having extensive root development in some cases. Another cause of yellowing of leaves may be over watering. Be sure that your pot has the ability to drain excess water. You do not want your plants roots sitting in water.